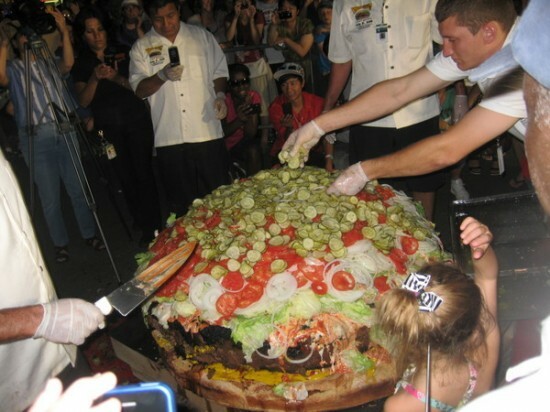 The last “world’s largest hamburger” weighed a massive 590 pounds, but that didn’t stop Brett Enright from blowing it right out of the water with an even bigger calorie bomb. 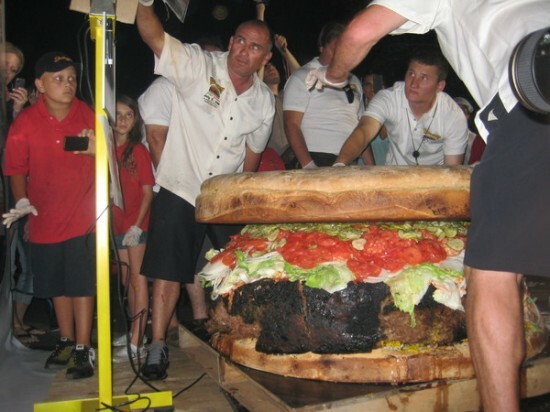 Enright, CEO of Juicys traveling barbecue catering service, first thought about attempting to make the world’s largest hamburger last December, while on vacation. He looked up the Guinness Record for the world’s biggest burger, and after a talk with Nick Nicora, co-owner of Ovation Food Services, he decided to try and beat it, at this year’s Alameda County Fair. On July 2, at 5 am, Brett and his helpers started working on their fast-food monster, by preparing 600 pounds of meat, which they expected would shrink to 400 pounds, after cooking. Then they molded 340 pounds of dough into two buns, which after baking were covered with 50 pounds of cheese, 20 pounds of onions, 30 pounds of lettuce, 13 pounds of pickles and 20 pounds of mustard and ketchup (10 of each). The burger itself was cooked on a giant, mobile barbecue called The Outlaw Grill. This mean contraption spends most of the year on the road, traveling from NASCAR events to concerts and fairs, cooking up a storm wherever it goes. This huge burger was its biggest challenge yet. 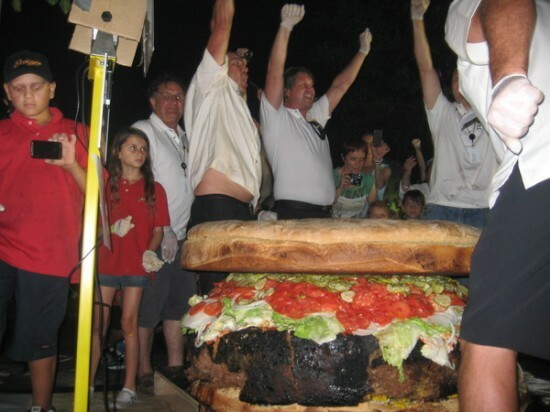 Although they started cooking early in the morning, making the world’s largest hamburger takes time, and the cooking process stretched long passed the estimated 5.30 pm hour mark. The Outlaw Grill was pushed to the limit, and the burger was finally ready to be served at 8 p.m. But first, there was a little matter of weighing, before the local crowd gathered for the event could sink their teeth into the juicy treat. It tipped the scales at 777 pounds of goodness, and the old record sounded more like child’s play. 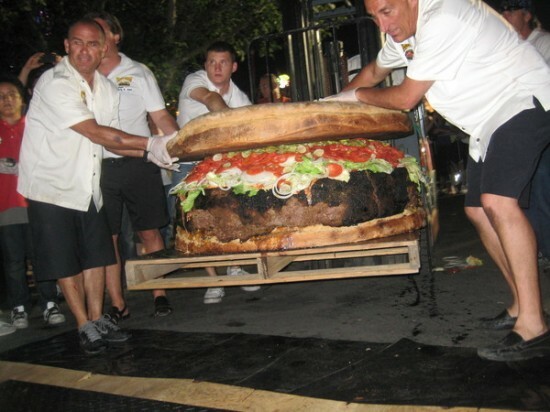 It was estimated the new world’s biggest hamburger contained a massive 1.375 million calories. Fortunately, no one person was allowed to eat it all, as it was cut into small portions which sold for $.99. The proceedings went to the Alameda County Community Food Bank.